What is an allium any way? Where can I get your product? Why eat garlic, how to store garlic? and many other questions about this wonderful aromatic root. When is your garlic available for sale? Well, her in Newaygo Michigan, we had a very hard cold winter for 2014 and 2015. This spring we did pre-orders and then found that much of our garlic was damaged and we were were terribly worried we could not fulfill the pre-orders. Therefore it's been decided it's best to NOT to do pre-orders in the coming years. 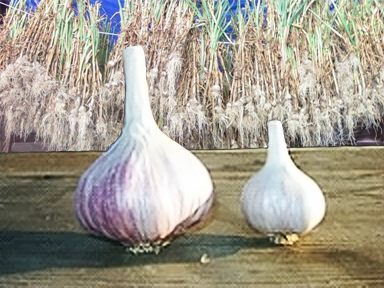 We will make our purchase buttons active after we have been able to harvest, hang and inspect the garlic. Where can I go to buy your produce? __ What is the garlic I see in the grocery store? Most grocery store garlic is a softneck variety of garlic because they have good marketing properties; they tend to grow large, store relatively long, and have lots of cloves. Historically these have been the basic California Early or California Late, but since eighty percent of the worlds garlic now comes from China I am not sure of the variety in the grocery stores. When facing a basket full of garlic bulbs, how do I know which ones to choose? The easiest ways to choose a good head of garlic is by picking it up and gently wrap your entire hand around the bulb then give it a little squeeze. It should be firm all around the head. Look to see if any of the cloves in the head are dented or mushy. The coloring of the skins may vary depending on the variety and sometimes the skins will be stained from the soil, but the head is still good as long as it is firm.